There are many, many, many differences between men and women. The one that I would like to touch on briefly here is the attitude towards shoes. Apparently women really like shoes. Case in point, remember Imelda Marcos and her 3,000 pairs of shoes? (where does one put 3,000 pairs of shoes anyway?) Allegedly she said, “They went into my closets looking for skeletons, but all they found were shoes, beautiful shoes.” One summer when I was in college, I worked at the Elder-Beerman shoe warehouse. The guys working there would sort out the orders for a store, pack the box and move onto the next order. The women would examine the shoes being shipped out, discuss whether or not they liked them and talk about which outfit they would wear with each pair of shoes, then they would box them up. Guys do not care much about shoes. 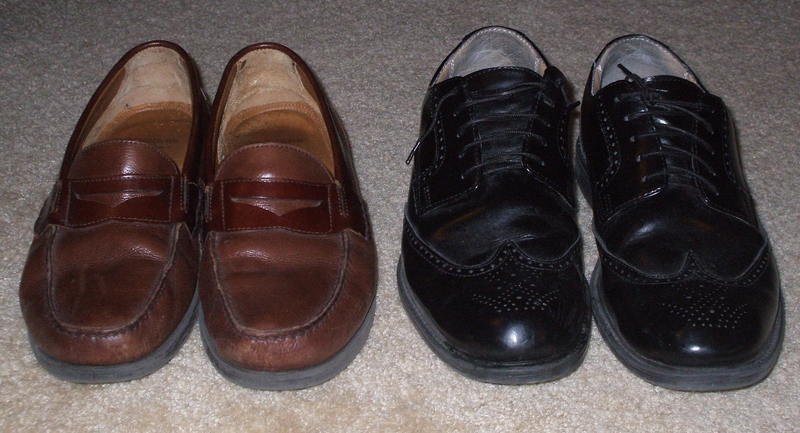 Many men might consider my shoes requirements a bit excessive because I like to always have two pairs of shoes, one black and one brown. This covers any need that might arise. To me the perfect shoe collection is a pair of black wing-tips and a pair of brown penny loafers. I have yet to come across an occasion where these will not suffice. Women like to go and buy new shoes on certain occasions: when the seasons change, when fashions change, when the sun comes up. Men never like to go shoe shopping, never, N-E-V-E-R. I once managed to avoid shipping for shoes for an entire decade (1988-1998 to be exact). I had a good pair of wing-tips and a good pair of penny loafers and I lived in a small town that had a shoe repair shop. So, when the hole stated to appear in the bottom of the shoe, I would drop them off at the shoe shop and $15 later, they would good for another year. Alas, most shoes these days have the bottoms glued instead of sewn and it is hard to find a shoe repair store. So, now I have to buy a pair every year of so. Even now, I seldom actually shop for shoes. My wife will find a suitable pair on the clearance shelf and bring them home, problem solved. When I actually go to buy shoes I am always amazed at how difficult it is to find a pair of wing-tips or penny loafers. Instead there is an ever-changing variety of shoes with pointy toes and flashy buckles, I suspect all these shoes are being designed by women. So, guys don’t fuss when the lady in your life fills up the closet with shoes, just ask her to leave enough room for your two pair. This entry was posted in Humor on September 30, 2014 by Leonard. well said, my friend. You laced them up, didn’t keept tongue in cheek, and “souled” us on that one. I try not to be a heel…. Thanks Sandy, for the blog I think you have to change it through WordPress or just sign-up with the new address.